"Come to ride, relax and experience our very special corner of Paradise. We are not just a 'nose to tail' ride, but a ranch that caters to real riders who care about the quality, care and treatment of horses. Our goal is to provide an unforgettable cultural and equestrian experience to our clients and friends." Join us for an exceptional riding getaway at a intimate horse ranch located minutes from the famous white sand beaches of Guanacaste. Known for their beautiful, well cared for and expertly trained Criollo horses, our hosts will personally treat you to a sincere home -style hospitality and excellent riding. They have developed their home into one of the finest horse ranches in the area, breeding and training their own special stock - including a vivid line of painted Pasos and Criollos! 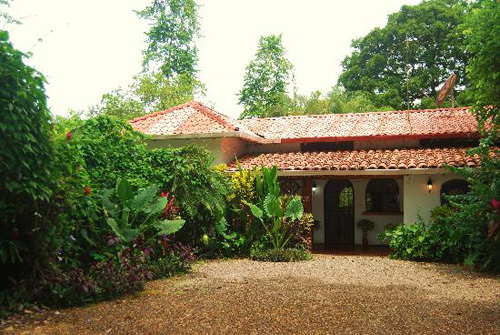 Located in an oasis of large Guanacaste trees and surrounded by green pastures, you will be just minutes from some of the most beautiful beaches in Costa Rica. The ranch is also centrally located to take advantage of Guanacaste’s famous tourists attractions and is a haven for wildlife, especially howler monkeys and tropical birds. After your daily riding ventures, take a refreshing dip in the casita -side splash pool, lounge in a restful hammock in the shade with a good book, or take a bird walk on the surrounding trails. Your host will take you to visit and play in the local seasonal fiestas and truly involve you in a taste the authentic culture with her friends and the locals. Visit the nearby national park and its resident volcano, ride along the pretty beaches and experience the traditional sabanero cowboy culture of Guanacaste! This trip can be designed to please both avid riders and their non-rider friends. We are more than happy to try and work with your vision of the perfect horseback vacation and deliver it in a big way! It is possible to arrange an extra 3-day extension trip to the Volcano of Arenal - spending 2 nights visiting and exploring the popular magnificent volcano destination including sightseeing, horseback explorations and thermal spa relaxation. Also, additional beach extensions can be added on if you wish to partake in local water sports for a few days! **Note: For client trip reports for this trip - see Old Spanish Trail's.. Transfers are available from Liberia International Airport (LIR), Tamarindo Airport (TNO), or hotels at anytime on any day of the week. Your arrival and departure can be any day of the week! Itinerary depends on arrival times. Other option: Hacienda Guachipelin Adventure Day. After breakfast take your last photos before you are transferred to the airport or next destination. Option for a horse activity if you have a late plane. (B or snack bag for the plane). Note: Order of the days and activities may change to take advantage of fiestas, tides and seasonal trails. After breakfast, if time permits ride in the ring or take your last photos and say goodbye before you transfer to Liberia or Tamarindo Airport . Optional stop at a gift shop or market is available depending on return flight times. (B or snack bag for the plane). The pace is adjusted to rider level and experience. Walk/trot on most of the trails, with cantering in safe and open areas, beaches, and country roads. Walk, trot and cantering in the arena. 3-5 hrs per day. Learn to ride or just sharpen your riding skills. Private lessons are offered by internationally recognized instructors. Learn ground work to dressage on well trained horses. Traditional, high stepping Spanish style instruction is also available on the famed Costa Rican Pasos. We offer a variety of clinics featuring experts in horse training, health and natural horsemanship (not included). 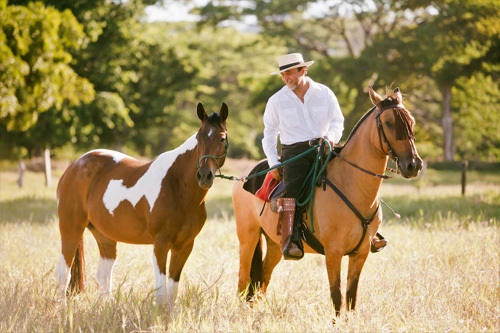 Chosen for their noble temperament and comfortable gate, the Spanish Criollo horses of Guanacaste are used for cattle ranching, rodeo, pleasure riding, fiestas and even lower level dressage. A combination of blood lines from the Andalusian, Barb, Jennet and later the Peruvian Paso, the Criollo horses are also the foundation for the Paso Costarricence. We will match rider to horse to give the best riding experience available in the area. Most of the horses were born on the ranch and trained with Natural Horsemanship, Imprinting and other non-violent methods. Most recently the finca began a “Paint and Paso” breeding program with a goal of breeding Criollo horses with “color and comfort” using their handsome paint stallion and Criollo mares. In some ways, Costa Rica is unlike almost all other countries in the world. The country is made up of many different climate zones, which also creates a lot of microclimates within the country. There is not a true winter season, and it is classified as a tropical country because of how close it is to the equator. It is more or less divided into two seasons, a dry season, often referred to as high season, and a rainy season, often referred to as green season. There is consistently about twelve hours of sunlight per day for the entire year. During the months of February to April, you will find the highest temperatures. Similarly, months like September through November are generally the coldest months that the country sees. The amount of rainfall in Costa Rica does fluctuate fairly drastically. From May to November, the rainfall is quite heavy, with the most rain coming in September and October. Opposite of that, December through April has very little rainfall, if any. Nationwide, the country averages around 100 inches per year, with some specific areas receiving up to 25 feet of rainfall per calendar year in mountainous areas. We have 2 spacious private casitas with that can sleep up to 4 people each. All casitas have air conditioning, fridge, microwave, coffee maker, DVD, High speed internet, WIFI, and open sky shower in private bathroom. All accommodations have access to splash pool, bar, and maid service. Cool off in the swimming pool after your ride or sip a cold drink while you watch the horses from the porch rockers. There is a safe in the main ranch house. Laundry is available for an additional fee. A comfortable casita with a queen and double bed, kitchenette, indoor star shower, cable TV with DVDs. A new 1-bedroom furnished house with a queen bed, single bed, and LR single bed, dining area, and full kitchen bar. There is no single supplement fees. All meals are included in the package except for 3 dinners while off property. Selection from a breakfast menu daily, including fresh fruit, fresh juices, cereal, eggs, meats, pancakes, fresh baked breads. Breakfast is provided on the garden porch or poolside. Most lunches are at typical restaurants on the rides. Dinners at the ranch and at local restaurants. Wine, beer and liquor are extra. Guests are free to bring their own. If adding on the Beach Extension dinner is not included on Day 9, lunch and dinner not included on day 10. For the 4 night Monteverde Extension dinner not included on day 9 and 10, lunch and dinner not included on day 11.